Optimal play is play that achieves the best results for the player, given subsequent optimal play by both players. Willemien: Thanks Bill, I know we are splitting hairs and YOU are the expert and I not even a deshi of you. Question: How should black respond to , a or b? (No komi). 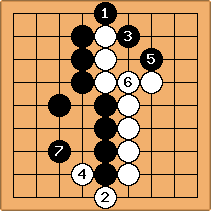 If black decides to hane, play might continue like this. 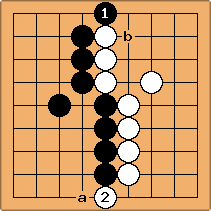 The first diagram might be considered perfect play for black. There are very few variations, and black wins. 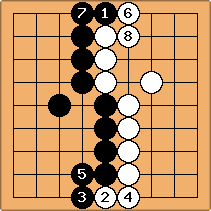 MrMormon: The idea of taking a risk directly contradicts the idea of optimal play. anonymous #2: But we are talking about different meanings of "optimal" (or the difference between "perfect" and "optimal"). What if you are in a position where, with optimal play from your opponent, you will lose. Should you a) play a strategy that will minimize your point loss against an optimal opponent, or should you b) play a strategy that will lose more points against an optimal opponent, but will win against a greater variety of non-optimal opponents?